Body contouring after massive weight loss is fast becoming one of the most talked about areas of cosmetic surgery. This segment of Inside Cosmetic Surgery speaks to American Academy of Cosmetic Surgery Trustee, Dr. Robert Shumway on the hot topic, Post Bariatric Body Contouring. Dr. Shumway also touches on the importance of doctor education and patients doing their homework in finding the right surgeon to perform their cosmetic procedure. Listen to the interview, or read through the transcript below. Sharon Odom (SO): Hi everybody, this is Sharon Odom from Cosmetic Surgery Today and welcome to Inside Cosmetic Surgery, our continuing series of interviews with top doctors from across the nation. Our topic today is post-bariatric body contouring, and to lead the discussion, we are honored to have Dr. Robert Shumway, a board certified cosmetic surgeon from beautiful La Jolla, California. Hi Dr. Shumway, welcome. Dr. Robert Shumway (DRS): Well, thank you. Thanks for having me. SO: Well, thank you for joining us to discuss post-bariatric body contouring, and why don’t we start with the definition. What is that exactly? DRS: Post-bariatric contouring is one of the most important things that people can have done after they’ve had weight loss procedure such as the gastric band or the Roux-en-Y gastric bypass procedure or other Nissen fundoplication procedures that help patients lose weight, but they have a lot of cosmetic issues thereafter. So post-bariatric body contouring is how we shape people cosmetically to help them look better after weight loss. SO: Because after weight loss, there is a lot extra skin from where their body was big before and then shrunk, right? DRS: Extra skin, extra fascia, and also areas that don’t look right from stretched or torn tissues that needed to be repaired. SO: If there is loose skin on the face as well, does the patient go to another cosmetic surgeon to have that type of procedure performed? DRS: So they do need to have different procedures for different parts of the body, which are oftentimes broken up into different days or different surgical days. Yet, some physicians will specialize on the face, and some will specialize maybe in liposuction. Other cosmetic surgeons have been trained to do both of those areas and it can be addressed. For facelifts, we might use fatty tissues to actually go back in to fill it an area that’s been deflated or we may need to use some suspension techniques in order to lift the face so it looks more aesthetic and pretty. SO: So I guess it depends upon the doctor that they choose to do the surgery because if the doctor only specializes in, say, the lower part of the body and they needed some upper body work done like in the face, then they have to go to somewhere else, right? DRS: Right. Oftentimes, general surgeons or gynecological surgeons who have had additional training and additional credentialing make very good body contouring physicians. Head and neck surgeons or facial plastic surgeons or ocular plastic surgeons or oral and maxillary facial surgeons who have additional training for facial cosmetic work might delve in there. Those who have been trained ubiquitously across the board and feel comfortable with all those different procedures might do things like facelifts, tummy tucks, liposuction or breast lifts, etc., arm and extremity lifts. So it depends on the practice and the volume of the physician’s work. SO: Who is the ideal candidate for post bariatric body contouring? DRS: It’s somebody who is stable from weight loss. In other words, they are not still trying to lose weight and that they are in good shape nutritionally and they don’t have a lot of other risk factors such as smoking or diabetes or having problems with the super high cholesterol and they are having trouble with their high blood pressure, or things like that. So those all need to be addressed and controlled first before we move forward with body contouring. SO: Does it make a difference in your approach if the patient lost weight quickly versus over longer period of time? DRS: The standard approach is losing a few pounds a month rather than going on crash diets. It’s better to have somebody who has lost weight over a period of time. When they have a body mass index that’s well over 30, they really need to be stable between 25 and 30 before body contouring procedures in the range of around six months of stable weight with weight loss that didn’t come off all at once and they don’t expect any huge changes in the ensuing future. SO: It’s better if they lost the weight over a long period of time. So if someone comes to you and they lost weight quickly, you would tell them to wait for six months. DRS: Yes, and we would see them back probably every month to see where they are. Have a consultation with them and make sure that their weight really is what it says. That way we can check their weight and we can get laboratories to see how their protein levels are, et cetera. SO: With post-bariatric patients, do they need to be thought of differently in terms of the body contouring versus a person of normal weight? DRS: Somebody that comes in like, for example, today who is very normal in weight, has had a baby and wants to be shaped, say, around the midline might be an excellent candidate for lipoabdominoplasty. Where a person who has had extensive weight loss who may have a panniculus or an area that hangs over might need more like a belt lipectomy where the incision is longer, the recovery maybe more difficult. The condition of the patient maybe somewhat suboptimal because they still have other issues such as excessive fatty tissues that are probably going to stay there for the rest of their lives, yet they probably really won’t lose that weight. So I always look at bariatric patients from a more of a workup standpoint. They need to be thoroughly worked up before you would actually do surgery on anyone who has had bariatrics. I need to know what their iron count is to make sure that they’re not anemic, that they don’t infections at other places, that they don’t have other complicating issues such as diabetes. Oftentimes they should have several other physicians with consults from internal medicine doctors or even cardiologists to clear them for cosmetic procedures. SO: What are the unique challenges and possible complications of this type of post bariatric body contouring for the patient? DRS: Usually, bariatric patients need help not only with the torso, but the extremities as well, and oftentimes in the neck and/or the face. As you lose weight, you become more gaunt in your appearance in the face and also the submental or the area beneath the chin takes on a different appearance. So this extra tissue has to be redraped and refilled so that it looks natural, but it looks not surgerized on after the procedure has been done. For the torso, brachioplasty or arm tucks and tummy tucks, breast tucks or breast lifts and/or reductions can be performed along with thigh procedures. In other words, when the thigh becomes lax because the fat has left the area, it may need more of an actual lifting procedure rather than true liposuction. So once the torso has been addressed, then you have to consider the skin itself. SO: Okay, so something struck me right away when you say when the fat has left the area. There is something about that just made me laugh because that’s something that a lot of people would really like, if the fat would leave the area. DRS: Yeah, that was the whole idea with the bariatric surgery. To begin with, it was to make fat leave the area. Fat is a great filler. As a matter of fact, we would like to shift the fat into other places, so if we are able to find some fatty deposits, we can reanimate other portions of, say, the face or even the gluteal, the buttocks lift concepts need to be addressed. So fillers are good. The fat is wonderful. It just needs to be appropriately positioned and deflation with the saggy skin and the saggy fascia needs to be repaired. SO: How many procedures can you perform in one surgery? Because if a person has multiple areas to be addressed, I’m sure that you can do more than one procedure, right? DRS: Yes. The safe rule of thumb is four hours per cosmetic procedure or procedures is plenty. So I am in a joint commission certified facility, so I’d like to follow that particular rule and I think the American Academy of Cosmetic Surgery would feel strongly with the guidelines of liposuction that we put together twice this past decade. So in other words, there is a certain amount of fat that be removed when fat does need to be removed, which is generally around five liters in an ambulatory setting, and the amount or length of time is always a consideration. I personally like to use local procedures such as tumescent along with some conscious sedation so that I never use general anesthesia which is a greater risk to the patient and likely the surgery itself. SO: So you don’t do anything that requires general anesthesia. DRS: That’s correct. Even tummy tucks, breast lifts and facelifts and all done under conscious sedation and local infiltration techniques. SO: Wow. So if someone needs something done and it goes beyond four hours, then they need to schedule another surgery? DRS: Well, that’s all determined beforehand. The surgeon would know how long it would take that person to have, let’s say, a belt lipectomy or a body lift or torso lift, so that could be done in one setting and allowed to heal. So they can come back later for their thigh tucks and their arm tucks and perhaps in the future maybe another time they can address the face. So it should be just like you eat a sandwich, you wouldn’t chew it all up in one bite. You take bites out of it until it’s consumed and then there is no problem with digesting it. SO: Okay. Is there a preferred sequence? Do you do one area, the neck area, like you have a map? DRS: Yes, I listen to the patient’s needs and wants first. They may have a real concern with their tummy area, so that would be a good place to start. Other folks have excessive skin tissue that’s very prominent in the lower face and neck area and that’s what people see more, so they might try to have a facial procedure done first. SO: Now, what about insurance? I know that it will sometimes cover bariatric surgery. But what about the post-bariatric body contouring that’s needed afterwards? DRS: Insurance for bariatric procedures and weight loss is very helpful, and I think that’s very appropriate because it affects the patient’s health. The mental health and the overall quality of life that’s improved with cosmetic surgery haven’t really found its way into the insurance industry yet. SO: What about the recovery time for this post-bariatric body contouring? What is the downtime? How long does it take to recover with postop care, that sort of thing? DRS: I always give people a one-month window when they are doing body procedures. The face and neck area tend to heal the quickest because it has such a wonderful blood supply where the torso is going to lag behind that. So a one-month period of time is usually a standard for doing tummy tucks, et cetera. Those who are doing extremity tucks might even require a little bit longer, maybe up to six weeks to eight weeks for full healing. SO: As far as choosing a cosmetic surgeon, what should a patient look for when they think about doing this post-bariatric body contouring? What should they look for when trying to choose a surgeon? DRS: I think it’s easy to look at your hand. There are five fingers there and so I would put my hand up and I go through this with the patients. Number one, they need to go to an office and that physician has been certified by the American Board of Cosmetic Surgery because it’s the only board that is totally dedicated to the specialty of cosmetic surgery. So that’s the first hurdle. Now there are other doctors who may not be board certified, so if they don’t have their boards in cosmetic surgery, they would need to have their boards in a specialty that would help serve that area, such as somebody who’s going to do facelifts or rhinoplasties, or let’s say, eyelid lifts, then they would need to be a facial plastic surgeon. So they have to look at the background of the physician. There are board certifications and number three is how many of these procedures do they do in a year. Is this something that’s done once a year? Or is this something that’s done twice a year or once a month, or this is a weekly procedure that physician has done many times. The other is has the physician been involved in teaching other doctors. And then the other aspect is they want to be able to see befores and afters from that particular physician’s work, so that they can comfortably understand visually of what is realistic and what’s not realistic. SO: Do patients ever come back to you to get follow-up surgery, or the result is fairly permanent? DRS: Well, the results are totally permanent with every [post bariatric body contouring] procedure that’s done because you are actually removing tissue, reconstructing it, and putting them into place. You can always do further procedures, one, because of patient aging, or two, just because they are looking for another type of look or further refinement, and then also sometimes, patients will tend to gain or lose weight and that might also affect their overall results. SO: Yes, that’s what I want to ask. What if the patient gains some weight, would that undo the results of the surgery? DRS: It would depend on what percentage. So let’s say a person weighed 200 pounds and their ideal weight was 120. Let’s say they got down to 120 and they had a number of cosmetic body contouring procedures done after having, let’s say, bariatric surgery. Their bariatric gastric bands, let’s say, was removed and now they are back up to 150. So they are really 30 pounds above where they should be. That would represent about a 20% weight gain. So different things would need to be done for different weight gain. Sometimes it’s diet and exercise for six months following up with the physician’s office is the appropriate therapy to give rather than doing a procedure. So in other words, surgery really is the last resort that we use. It’s done because there really is no other good option. The option is played when the patient is tuned up and is that an appropriate body mass index or BMI, so that they get the best results, have the less chance of complication and also are more likely to come back to that physician because they trust them, they trust the doctor and the practice and they know that they’ll get good care for whatever kinds of things that they really need from a cosmetic standpoint. SO: What if someone gained some weight and then they lose that same amount of weight? So let’s say they gained 30-35 pounds after they had the surgery and then they slapped themselves and said, “I went through too much trouble. Let me get this weight off.” Would they look exactly the same as they did after the surgery was done? DRS: They generally will because as long as not too much time has gone by and they haven’t stayed at that more of a modern obesity for too long of a time. There will be some metabolic changes internally for sure, but once they get back to further exercise and dieting, in other words, controlling intake and caloric usage is really the whole key there. The appearance of somebody going back from weight gain to weight loss, the weight gain to weight loss, that’s actually not a very good thing to go through, not only physically, emotionally and cosmetically, but it should be a little bit of a red flag to the cosmetic surgeon saying that this person has a tough time maintaining stability, in other words, homeostasis. That what’s really key. Once you get a person fixed up to where they are looking nice, you really want to encourage them to stay in that category of life. SO: Do you have any patient stories you would like to share, and no names, of course, but just the story itself? DRS: Yeah, I have a number of patients who have been well into their almost 300-pound range on which I said, “Well, we need to first do the bulking of these areas.” So once we debulk them with liposuction, oftentimes they are so happy with the results, they are done, they are finished, they are happy and they don’t need anymore surgeries. I had a patient from England several years back. She is a TV personality there and we did quite a bit of torso and body liposculpting and she looked marvelous. She had one of the super 8 figures that looked just stupendous. And she called me about two years later and said, “I’d like to come back over for some more liposuction.” And I had done two sessions with her previously, and I said, “That sounds fine. Why are you coming back over? Didn’t we get enough fat out with the first couple of times?” She said, “Oh no, that’s not the problem. But it’s that I gained 50 pounds.” And so in that situation, she was from across the ocean so we had to work with weight control there and then later on, I just helped her with some contouring and little tucking procedures. So you have to look at the skin as an envelope that expands and contracts and sometimes it needed to be tucked if the expansion has been beyond its resiliency to contract back again. SO: Well, I know that this is a busy time for you, so why don’t we tell people how they can find out more about you. What’s your website? And I am a current trustee of the American Board of Cosmetic Surgery or the ABCS. I am a trustee of the American Academy of Cosmetic Surgery, the AACS. 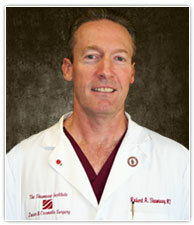 Past President of the California Academy of Cosmetic Surgery, the CACS. And the past President of the American Society of Cosmetic Breast Surgery, or the ASCBS. So the important thing is to continue your training and to encourage physicians to become good at what they do, specialize specifically in cosmetic surgery procedures, and always be truthful in their advertising and in the things that they can and cannot do. SO: Thank you very much, Dr. Robert Shumway, from La Jolla, California. It’s been a real pleasure and we will speak to you soon. Thank you so much. DRS: Well, thanks so much, Sharon. It’s been a pleasure.